The numbers next to the headings below, indicate the position of that person in the Ahnentafel (Ancestor Table) with Christopher himself in position 1. Christopher Isherwood was born 26 Aug 1904 at Wyberslegh Hall in High Lane, co Chester, the son of Francis Isherwood and his wife Kathleen Smith. He had a brother Richard. Their father was killed in World War I. Early in his life he met the slightly younger W.H. Auden and the two would collaborate on several works over the years. They possibly as well had a casual, sexual relationship. Christopher moved about 1928 to Berlin, then under the sexually-open Weimar Republic. Around 1932 he met Heinz Neddermeyer who at this time was about 17 and the two began a relationship described as Christopher's "first great love affair." They fled Germany about 1933 and were together until perhaps 1937 when Heinz was arrested and sentenced to time in prison and at hard labor for draft evasion. About his time in Berlin, Christopher wrote, in 1939 the short novel "Goodbye to Berlin". The work described by George Orwell as "brilliant sketches of a society in decay", would be the inspiration for the play and movie "I Am A Camera" which launched the career of Julie Harris -- the 1955 film version also including Shelley Winters. It would also be the inspiration for the film Caberet with Liza Minnelli, Joel Gray and Michael York. Isherwood and Auden had come to the United States together in 1938 as tourists and then in 1939 both immigrated to the United States just "months before Britain entered the Second World War" (Wikipedia). In fact they came together on the S S Champlain Jan 1939. Later that same year, a border-crossing card states that he was then living at 6406 Franklin Avenue, Hollywood; at that time he calls his mother "Kathleen Machell Bradshaw-Isherwood", so I suppose Machell must be her middle name. Christopher became a U.S. Citizen, his naturalization card being dated Nov 1946 at which time he states that he lives at 165 Mabery Avenue, Santa Monica. The next year, 1947, when he sailed on the Queen Elizabeth, his address, at first listed as Mabery Avenue is crossed out and instead an address of 207 East 52nd St, New York City is penciled in. In Jul 1948, again on the Queen Elizabeth, he lists his destination as the MGM Studios in Culver City. Perhaps he was working on a script ? In March 1952, on the Queen Elizabeth, he lists his address as 235 7th Avenue, New York City. Flying back later that month to Idlewild airport, he lists his address as 2000 Rustic Canyon Road in Pacific Palisades, California. 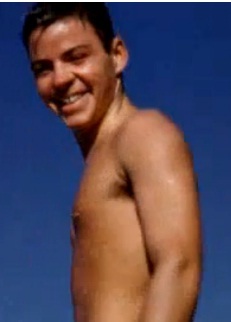 In 1953 he met the love of his life Don Bachardy who was about 30 years his junior. A movie called Chris & Don: A Love Story has recently been released, watch a trailer at this link. In March 1956, flying from London to New York City I find Christopher Isherwood and Donald J Bachardy. While in the Los Angeles area, Christopher met Swami Prabhavananda who he took as his guru in the study and practice of Vedanta. Christopher wrote a book about this called "My Guru and His Disciple" (1980). In 1964 he wrote his next important work "A Single Man" about a gay professor who has just lost his companion to an auto accident. Along with his earlier loosely-truthful autobiographical works, he wrote another autobiographical work called "Christopher and His Kind" which reveals much more of his life, and in addition, details his romantic relationships. 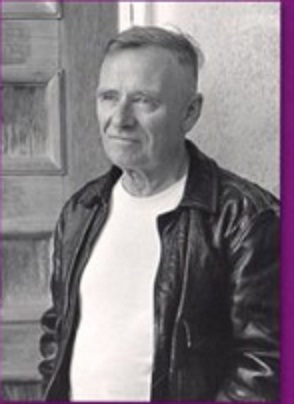 Christopher Isherwood died 4 Jan 1986 in Santa Monica, California from prostate cancer. Francis Edward "Frank" Bradshaw-Isherwood was born in 1869 the second son of John Henry Bradshaw-Isherwood of Marple Hall, co Chester and his wife Elizabeth Luce. Frank was killed in World War I.
Kathleen was born in 1868 at Bury St Edmunds, the only child of wine merchant Frederick Machell Smith and his wife Emily Smythies Greene. She was yet living in 1939, at that time in London. John Henry Bradshaw-Isherwood was born 27 Aug 1841, the son of Thomas Bradshaw-Isherwood of Marple, JP, DL for Cheshire; and his wife Mary Ellen Bellairs. In 1864 John married Elizabeth Luce, daughter of Thomas Luce, esq, MP Malmesbury.